I’m almost to the end of week 3 of my internship and despite the massive amounts of rain this week Emma and I still managed to accomplished nearly everything on our to-do list. Since the weather was so bad Monday afternoon, we figured Tuesday wasn’t looking so good either so we cancelled weekly lunch in the garden. 😦 We had plans to make a new vegan recipe for Swiss Chard and Garlic Scape dip, but now we have to wait until next week. For those of you interested in getting that recipe be sure to keep an eye out for the post on Emma’s blog, http://eatingwithemma.tumblr.com/ . The next day,Tuesday, was actually quite a nice day! So we could have had lunch in the garden…but better safe then sorry, I guess! With the nice weather we were able to plant an entire bed of jalapenos and another bed with some very important tomatoes. These “very important” tomatoes are none other than the tomatoes I will be studying for my biology research project! I am so excited to start conducting research and manipulating these little guys! Right now I am only in the developing stages, caring for the newly planted seeds, but I’m ecstatic things are up and running! The question I built my project on is how can manipulating growing conditions of tomato plants affect the yield and quality of tomato fruits. In turn I want to investigate whether it is more sustainable to grow greater quantities of fruit that lack flavor and nutrient composition or to grow lower quantities of nutrient dense fruit and relate this to food security and health. I am still in the developing stages of my investigation, but I have some time to decide where my research will go. The best part about this project is that I can take it wherever I please, so the possibilities are endless (within reason of course)! Another task I completed Tuesday was trimming off the flowers from the herbs. After trimming, my hands smelled like rosemary for the rest of the day, which wasn’t necessarily a bad thing! 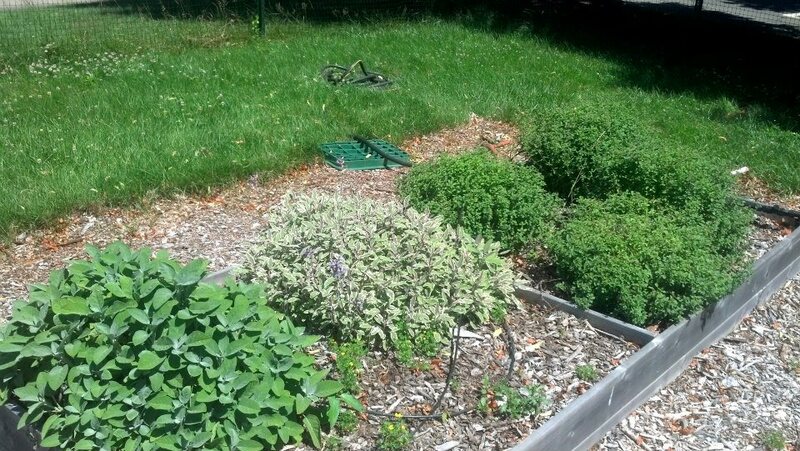 While, I was trimming I began thinking about how herbs have a reputation for having incredible health benefits. With this thought, I decided to conduct a mini side research project (currently in the works) about natural grown herbs and how they can help improve athletic performance. 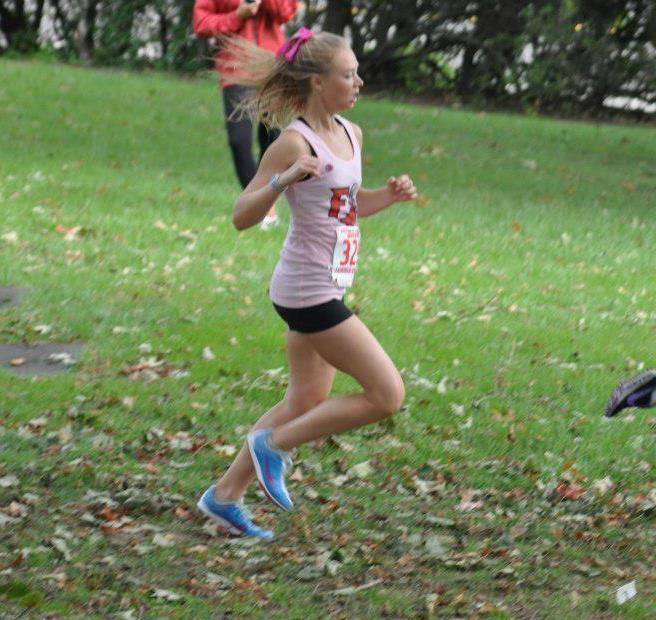 As mentioned in my “About Me” page I talked about how I have been a runner for years. Being a runner I am very conscious about what I put in my body. Food is fuel in my mind and I want to eat whatever it is that will make me stronger and faster. Conducting this research has been very interesting and I will be posting a follow-up post about my findings in a week or two, so keep a look out! Moving on from research, Wednesday was a transplant day for Emma and I and we thinned our crowded tomato sections in the demonstration beds. We moved the extra plants to a free bed and still had some extras so we planted 11 plants down at the Early Learning Center across the street. I’m sure the little kids will love picking the tomatoes once they begin fruiting! That brings us to today, which has been nothing but dreary and rainy. I really hope tomorrow isn’t as bad so the squash and cherry tomato rows can get planted. But, for now I will continue with research and cross my fingers for the next week to be filled with sun! Tags: agriculture, athletics, campus garden, crops, early stages, fitness, flowers, garden, gardeners, gardening, garlic scape, herbs, herbs and athletics, natural, nature, organic, rain, research, running, squash, swiss chard, tomatoes, vegan recipe | Permalink. This post is about one of my favorite things…BIRDS! 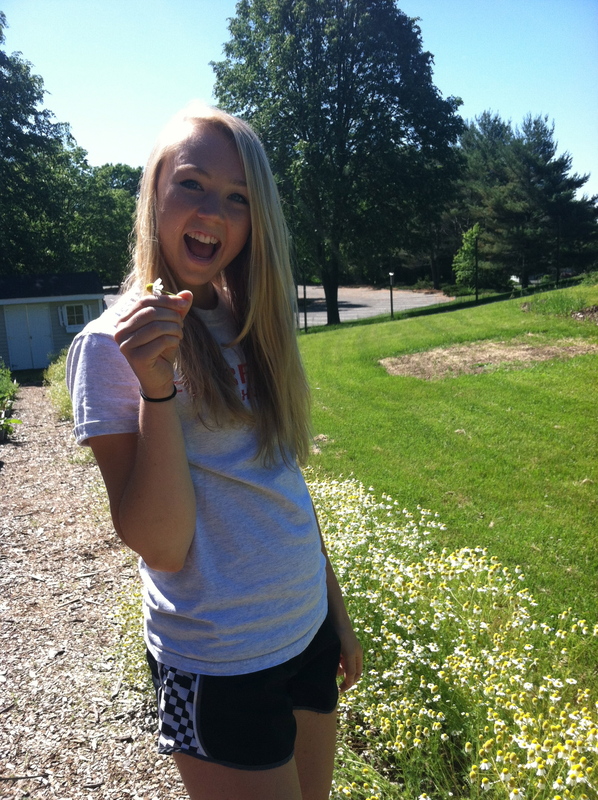 Last Wednesday, Emma and I were harvesting chamomile when I noticed something out of the corner of my eye…a baby bird! Right behind Emma at the far side of the garden was a little baby bird crying for food. He or she was adorable. 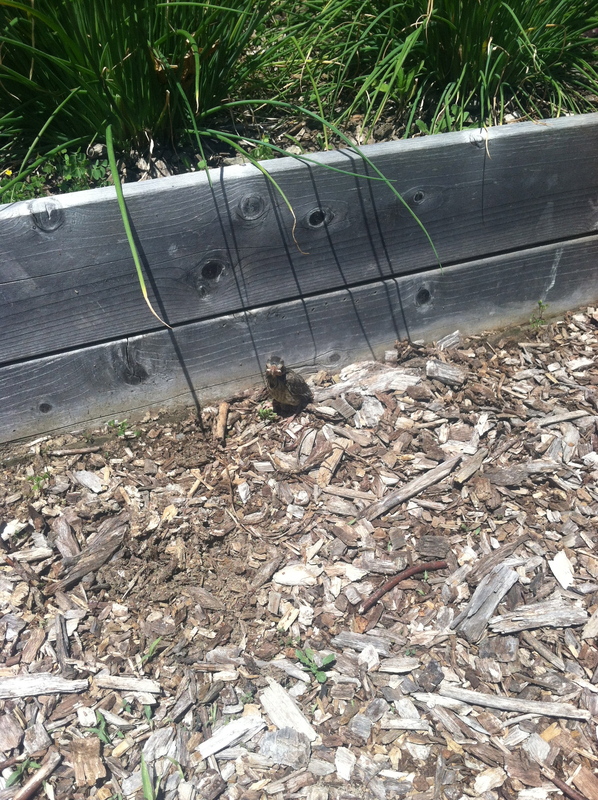 Naturally, Emma and I assumed the baby was from the song sparrow family nesting in one of the beds near the shed and we figured he got ambitious and left the nest getting lost in the process. We took pictures of the little guy and let him be while he continued to cry for help. After sometime one of the parent song sparrows found the baby and we watched as the mother or father bird first fed and then led the baby back to the nest. Emma and I thought this was the cutest thing ever and after the baby bird was safely back home we got back to work and went on with our day. Now, that may seem like a satisfactory nature story in itself, but just wait! Caution: PLOT TWIST APPROACHING! The next day we were in the garden with Tod, our supervisor and my previous Ornithology professor, mowing under the fence and mowing back the chamomile. 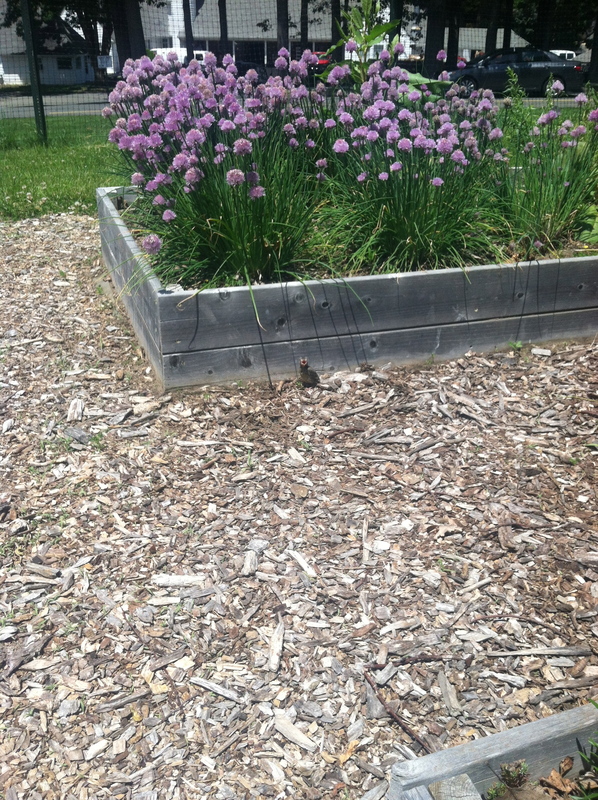 Once again Emma and I saw the baby bird lost again in the same spot. We showed Tod and told him our story from the day before. After a couple of minutes Tod broke the horrifying news. So, why I am dramatizing this whole thing that is seemingly not that interesting? Well, for someone who has studied birds, I was ecstatic to see what I learned last semester playing out in the real natural world. For some light background, a Cowbird is a bird that lives in North America that acts as a “brood parasite.” A brood parasite is an animal that uses other animals of the same or different species to raise their young. Cowbirds do this by depositing eggs in nests of other species (such as robins or SONG SPARROWS) and relies on that species to raise their young. Why do Cowbirds do this? Well, think about it…this animal behavior is an evolutionary marvel! While Song Sparrows and Robins are wasting and investing energy in an offspring that isn’t their own, the Cowbirds are using their energy to forage and produce even more offspring raising their fitness. 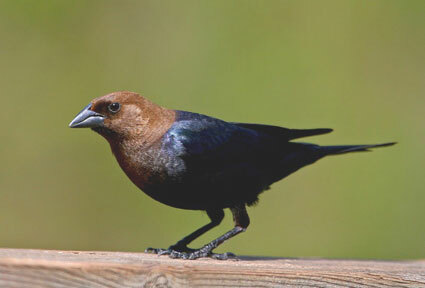 Therefore, the Cowbirds are the species who get the upper hand! 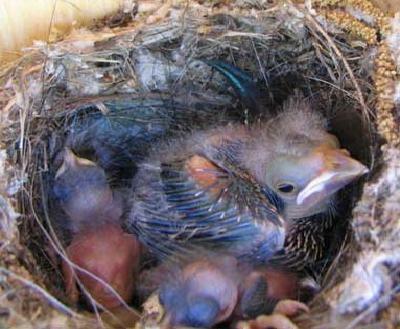 This my friends is why I was so interested in the baby bird being a Cowbird, it was an act of biology at its finest! I know you may think post didn’t have much to do with sustainability or gardening, but animals definitely do connect to gardening and sustainability in more ways than one. Birds in particular can be pests to gardens or beneficiaries to gardens by either eating crops or eating insects that can act as other pests. Everything in nature is connected and it is important to remember that your garden will be affected by nature in ways that you can and can’t control and its best to not become frustrated with natures ways but instead to appreciate and embrace it! Tags: animal, biology, birds, birds in the garden, brood parasites, brood parasitsim, cow birds, cowbird, fitness, garden, natural, nature, pests, song sparrows | Permalink. So, I am sure you have been anxiously awaiting this post to learn how to make your own natural chamomile tea.Forget those conventional tea bags cause harvesting your own tea is much more rewarding and fun! 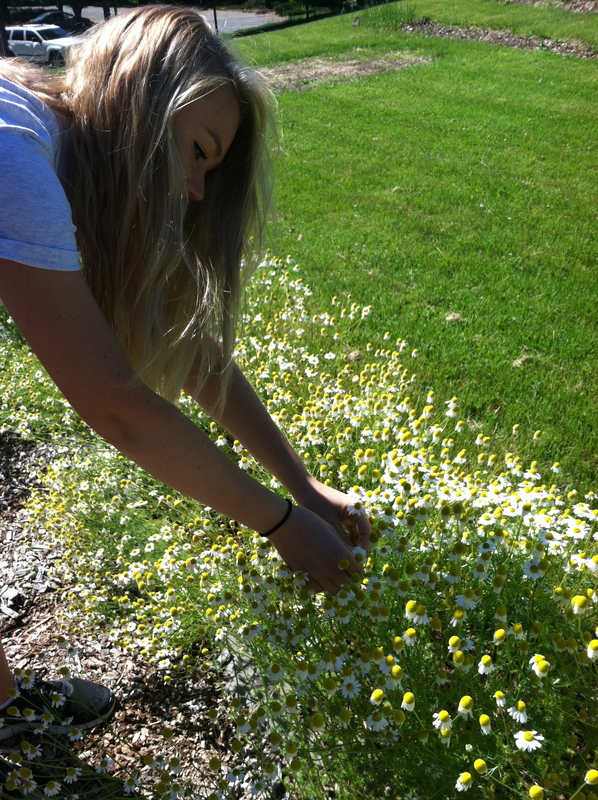 The first step to making your own tea is to find Chamomile seeds. I know Home Depot sells them and I’m sure if you go to any garden store they would help you out. The type of seeds that 2012 garden intern, Jesus, planted in the garden was German Chamomile seed, an annual chamomile plant. 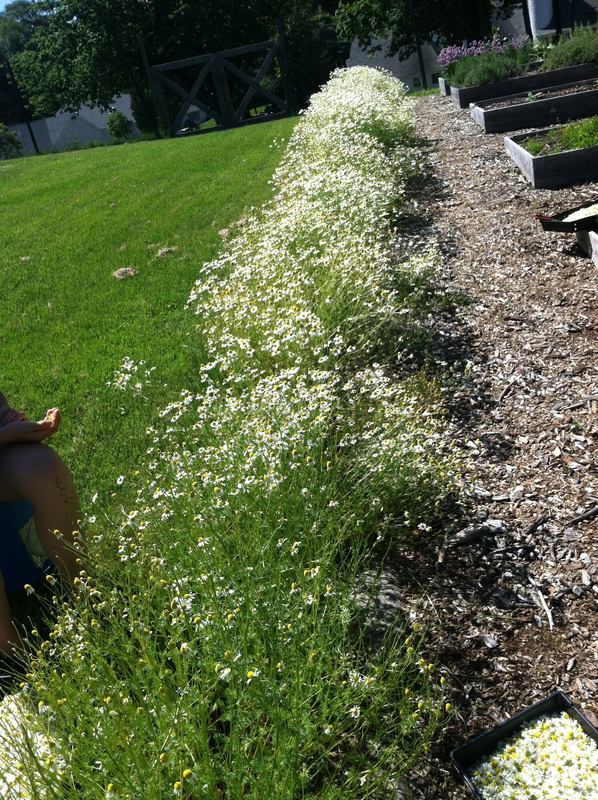 Once your chamomile seeds are in the ground, you need to wait until the flowers are in full bloom. From the day of planting until blooming takes about a month. Once the flowers are in full bloom get ready to harvest! All you need to do is cut the stems of the flowers 2-3 inches down from the flower. 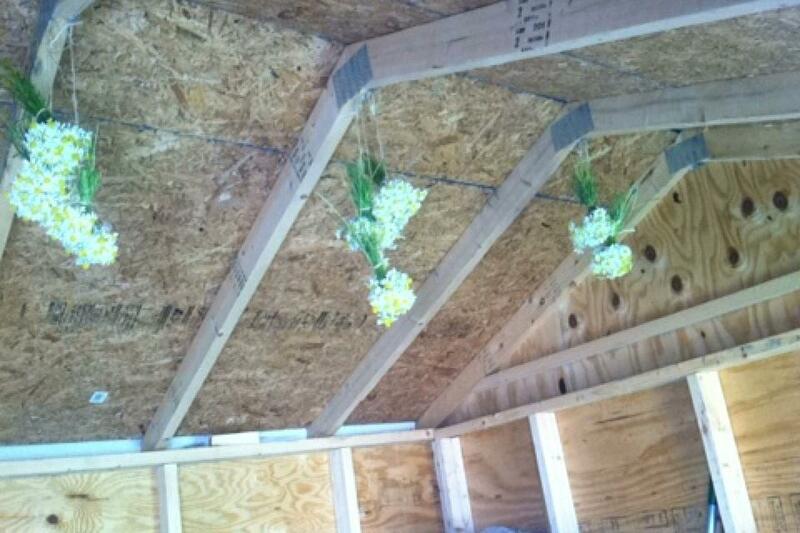 Then, bundle the individual flowers with twine and make as many bundles as you desire. What Emma and I discovered is that one bundle that has a stem diameter of about 1-1.5 inches should make about 6-12 cups of tea. After you bundle the chamomile, hang the bundles in a dark, warm place. We used our garden shed which worked great! Let the Chamomile hang for 1-3 days and wait for it to dry. 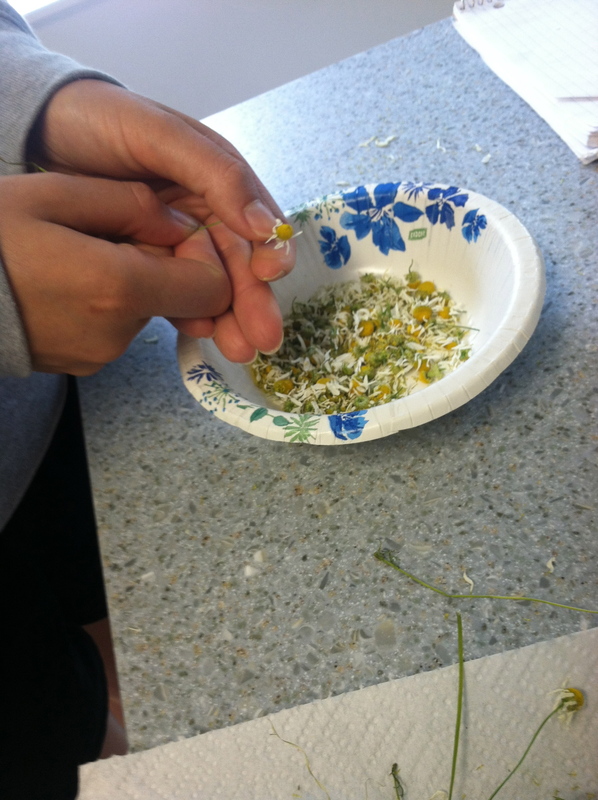 Once the Chamomile is dry pop the individual flowers off the plants. Those dried flower are what you will eventually boil to make your own tea! Store the dried flowers in an air tight container until you are ready to use them. 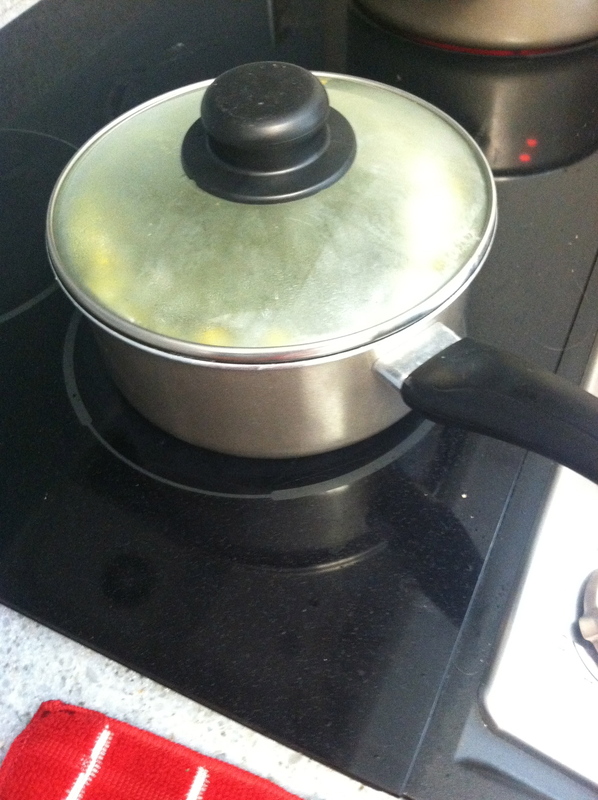 When you are ready to make the tea, boil the desired amount of tea water in a sauce pan. Wait for the water to boil and then for every cup of water you boil add 1 heaping teaspoon of dried Chamomile. Turn the heat to low and let the sauce pan sit on low heat for 30 seconds. Then, remove the saucepan from the heat and let the Chamomile sit in the hot water covered for however long you like or until the liquid turns a pale yellow hue. Emma and I decided to let the flowers sit for quite a while because we wanted the tea to have a strong flavor and color. 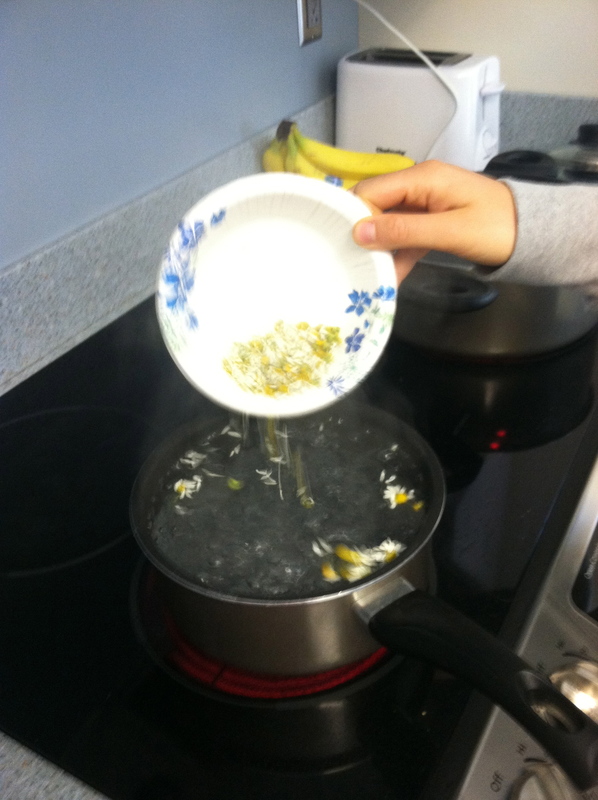 After you let the chamomile seep, strain the chamomile flowers out of the liquid. We did this using a tea strainer, but a normal strainer would work just as well. After this step you are all ready to drink! If you prefer to have it iced, like us, let the tea cool to room temperature, and then pour into a container to store in the fridge to chill. When ready to serve add some ice, sliced lemons, and some local honey to sweeten and you are all set! Hope you all enjoyed this post and are on your way out to buy your own Chamomile seeds! Tags: agriculture, campus garden, chamomile tea, german chamomile, grow your own, grow your own tea, natural, organic, organic chamomile, organic tea, tea | Permalink. hillarymaxson on Week 5: Birthday Week! nutrishus on Week 5: Birthday Week!